A robotic humanoid astronaut on the International Space Station is about to get its legs. NASA has crafted a pair of space legs for Robonaut 2, its robotic astronaut torso on the space station now. The legs will fly to space aboard SpaceX's unmanned Dragon capsule, set to launch from Cape Canaveral Air Force Station in Florida on Monday (April 14). Robonaut 2 surpasses previous dexterous humanoid robots in strength, yet it is safe enough to work side-by-side with humans. This image shows NASA’s Robonaut 2 with newly developed climbing legs, designed to give the robot mobility in zero gravity. With legs, Robonaut 2 will be able to assist astronauts with both hands while keeping at least one leg anchored to the station structure at all times. Image released Nov. 13, 2013. "The new legs are designed for work both inside and outside the station, but upgrades to R2's upper body will be necessary before it can begin work outside the space station," NASA officials said in a statement released in March. R2's legs are not like a human's lower limbs. The legs each have seven joints and in place of feet, the robot will have an "end effector" attached to the end of each leg, NASA officials said. The end effector allows R2 to use sockets and handrails inside and outside the station, and the two devices also come equipped with vision tools that controllers can use to visualize and automate the movements of the legs, NASA added. Robonaut 2 has been onboard the space station since February 2011, and since that time, it has performed a variety of tasks to show its usefulness in microgravity. The $2.5 million humanoid robot can flip switches, press buttons and turn knobs. "In preparation for future spacewalks, R2 has worked inside the space station with space blankets and other flexible materials, both through ground control and through teleoperation by the on-board crew," NASA officials added. Monday's launch will be the third official cargo mission to the International Space Station for SpaceX. The private spaceflight company has a $1.6 billion contract with NASA to fly 12 missions to the station using the Dragon capsule and Falcon 9 rocket. 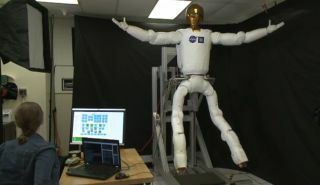 NASA is planning to do initial checks of the legs in late June, and after that checkup, Robonaut 2 is expected to make its first steps on the space station. The space agency also has a twin R2 on the ground. Recently, that robot was used to perform an ultrasound scan on a mannequin and administer an injection to the dummy. The Earth-bound R2 was remotely controlled by a doctor while performing the tasks, a potentially useful option in space, where astronauts are far from hospitals.